There are a few recipes I make on Thanksgiving that I call “one-hit wonders.” That is to say I don’t make them on any of the other 364 days in the year. I’m no fan of stuffing, for example, so I keep the masses happy by making it on the holiday and then we forget about it until next year. My Maple-Glazed Sweet Potato Gratin was in the same category for no other reason than it just seemed a little decadent to serve on a day that isn’t considered the biggest meal of the year. 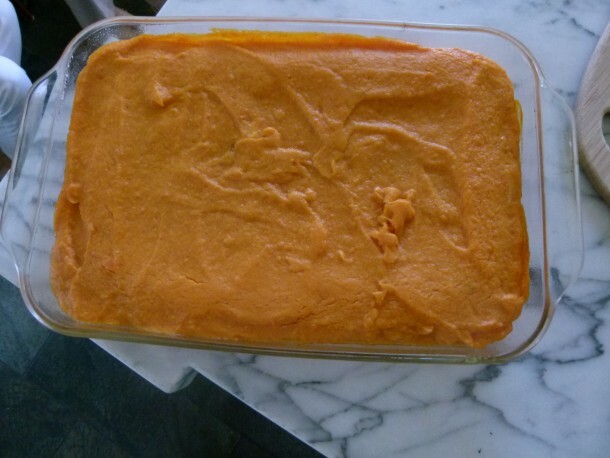 Just for fun, I recently tried a new sweet potato recipe which my kids absolutely flipped for. Not only has this Sweet Potato Casserole bumped the former gratin out of the coveted spot, but my kids have begged me to make it multiple times since then. My girls have even eaten it for breakfast and as an after-school snack. 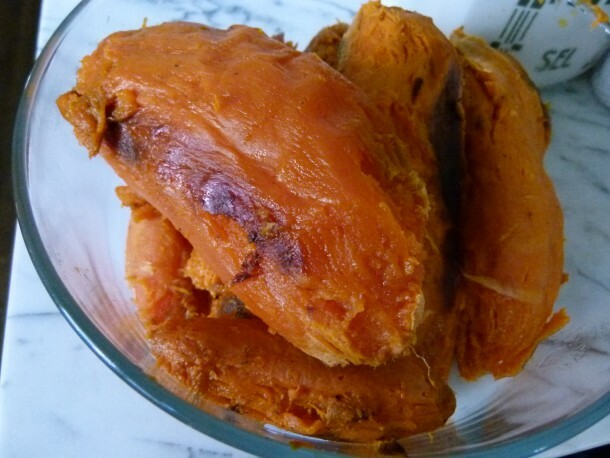 I am crazy for sweet potatoes any which way and I am perfectly content with a nice big juicy one plain and simple. So when recipes start adding cups of brown sugar with marshmallows or oatmeal cookie dough on top, I can’t take them seriously. We’re going to try and keep things classy over here, ok? But there was something intriguing about this recipe from Food & Wine that I had to try. Despite the pureed sweet potato base mixed with eggs, milk, butter and an obscene amount of sugar, I saw potential. The topping is what really had me since I just love a contrast in textures. I could already taste the silky puree with the light and crispy cinnamon-nutmeg flakes and nuts. Even after I cleaned up this recipe by cutting the sugar by almost two-thirds, the casserole was still absolutely divine and a perfect complement to your Thanksgiving buffet. It’s also super easy to make if you have a food processor and can be done in advance (Thanksgiving magic words!) By the way, I have also made this recipe dairy-free with success by using coconut oil instead of butter and unsweetened hemp milk instead of regular. Since it’s already gluten-free, everyone’s happy! What? Did you just call me “trashy” behind my back for using cereal in a Thanksgiving recipe? Guilty. Maybe I deserve it. You know what I say? Worth it! Preheat oven to 400 degrees. Place the sweet potatoes on a parchment-lined baking sheet and bake in the oven until tender, about an hour, but could be more depending on size. 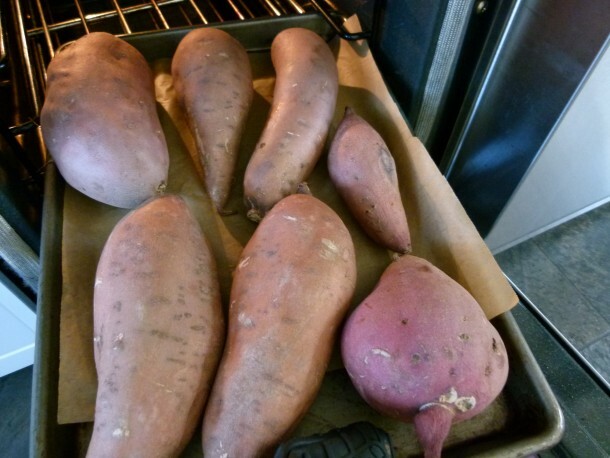 Or you can also boil peeled, cubed sweet potatoes in water for 15 minutes or until tender and drain, but I think roasting the sweet potatoes makes then sweeter. Lower the oven temperature to 350 degrees. Butter a 13 x 9 inch baking dish. When the sweet potatoes are cool enough to handle, peel and discard the skin and place potatoes in a food processor. Puree until smooth. Do this in batches if necessary. Transfer the puree to a large bowl. Add half the butter (6 Tbs. ), salt, 1 teaspoon nutmeg, maple syrup, and milk. Stir to combine and then stir in the eggs. Pour the mixture into the prepared baking dish and smooth the top with a spatula. Recipe can be made up to this point one day in advance and kept covered in the refrigerator. Cover with foil and bake 40 minutes. Spread the pecans on a baking sheet and bake for 5 minutes, until lightly toasted. Transfer the pecans to a cutting board and coarsely chop. 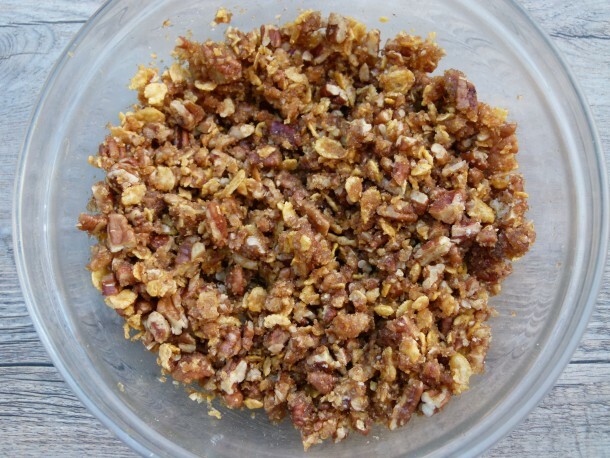 In a bowl, toss the pecans with the cornflakes, cinnamon and remaining 6 tablespoons of melted butter, ½ teaspoon nutmeg, maple or brown sugar and a pinch of salt. You can bake this up to 4 hours in advance and serve it warm or at room temperature. I don’t own a food processor. Can I just mash the sweet potatoes by hand? Also, would love to see the coconut version as I’m allergic to corn (and corn is not Passover friendly). Thanks!! Sure! It won’t be as smooth, but you could also do it in small batches with an immersion blender if you have one, or in a blender. Just add all the ingredients (milk, eggs) so the blender moves. Make sure the sweet potatoes are extra soft. To make the casserole without the cornflakes, sub the exact amount (1 cup) of coconut flakes (the big ones, not shredded.) You’ll love it! Hi! I’m making this tomorrow. 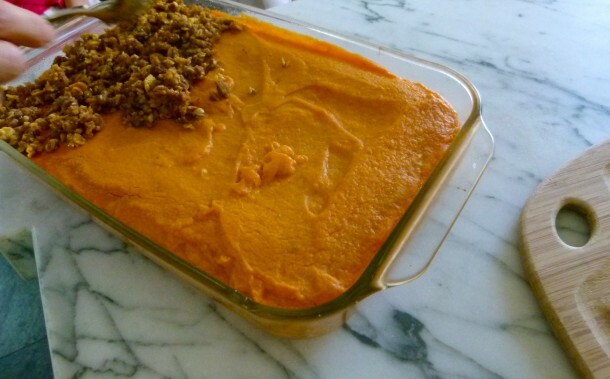 Approximately how many cups of pureed sweet potato equates to 5 1/2 lbs of sweet potatoes? I baked all that I had and didn’t weigh them. Thank you! Can this be made 2 days in advanced?? I haven’t done it, so I’m not sure. But I really don’t see why not. 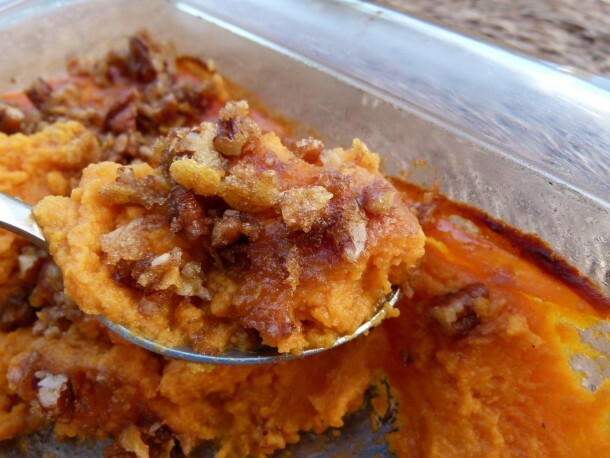 This the best sweet potatoes recipe ever I am not big fan of the sweet potatoes is this one is divine everyone asked for the recipe thank you Pamela!! You can try, but hemp has the same fat content as whole cow milk, so it’s a great sub! I think almond milk should be ok. A combo of almond and cashew might be better. Would you reheat this covered or uncovered at 350? Thanks! By “reheat,” do you mean you already baked it according to the directions covered and then uncovered with the topping? Yes as in already fully baked it according to the instructions…. Ok, I would reheat it covered so the topping doesn’t burn. Try to pull it out of the fridge ahead of time so you’re not putting it into the oven ice cold. Enjoy! Light brown or dark brown sugar? 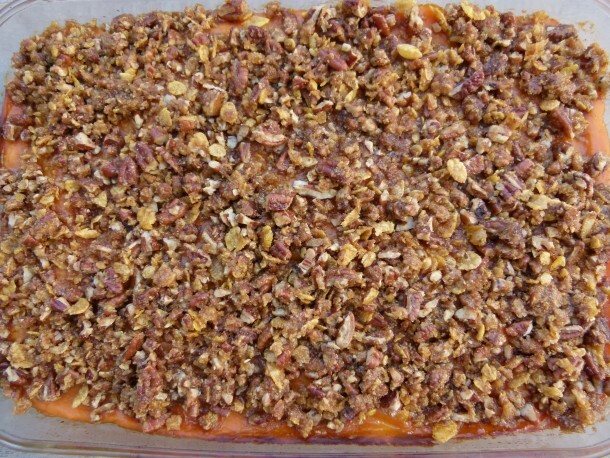 Everyone loved this at Thanksgiving, especially the delicious topping. The addition of the cornflakes added a nice crunch. I am wondering how long leftovers last in the fridge or If I can freeze this? Thanks! So glad you enjoyed it! I don’t usually leave leftovers for more than 3 days, even if they “last.” But I imagine this dish would last quite a long time without any problems. And it should freeze well since most purees like this do, but since I haven’t tried freezing it, I don’t know for sure. You can always test it out by freezing 1/4 cup or so and seeing what happens. Let me know if you do! I’ve made this recipe quite a few times over the holidays, our entire extended family loves it so they kept requesting it. I have shared the recipe with quite a few friends and family members. I just send them the link to your page. I absolutely love it and I didn’t used to be a big fan of just sweet potatoes. I have made half the recipe too when I have less than the 5 lbs. Thank you for such great treat of a recipe!! It’s like a soufflé! Pamela, we have a nut allergy in the family. Can I substitute the pecans for something else? Almonds are ok as are hazelnuts but pecans are definitely not an option. I would try chopped almonds for sure, or leave the nuts out altogether and just add more corn flakes. The nuts add nice crunch, but the dish isn’t lost without them. My new favorite way to eat these delicious SP! It was so easy. I made it the night before and then baked, added topping and continued baking as you instructed. The topping was easy to combine and it was divine when it was served. Many thought it tasted like pumpkin pie. A huge compliment! I served it about two hours after taking it out of the oven and it was perfectly warm and enjoyable. Thanks again, Pamela! Do-ahead recipes are the best. I’m thrilled this worked well for you! Happy New Year, Jenny! Thank you Pamela! Another quick one for you… If I wanted to half the recipe, how would you modify the cooking temp and time? Could I use an 8 X 8 dish and keep the baking temperature the same but shorten the bake time to maybe 25 minutes (both pre/post topping baking)? I’d love to make this more often for just our family of four. Any suggestions are appreciated. Thanks again! You can halve the recipe and use an 8 x 8-inch or 9 x 9-inch baking dish no problem. I would bake it for 30 minutes and 30 minutes. I have not tried it in a smaller pan, so I’m just guessing on the time. Let me know how it turns out! Thanks again! I will be sure to let you know after I try it. Happy new year to you! This is a fabulous recipe! I brought the casserole to a family Thanksgiving dinner, and it got rave reviews from everyone, including the young ones who said they NEVER eat sweet potatoes. Thanks again for such great ideas! You’re welcome, Mia! It was a big hit at our house yesterday, too. Who needs marshmallows???!! I’m making the sweet potato casserole and I want to do what I can of it tonight. On step four it says I can add ingredients (eggs, etc.) And then refrigerate. It then says cover and bake for 40 min. I wasn’t sure if that meant I should bake and then refrigerate and then just do rest of the baking tomorrow or I should not bake at all tonight. I’m glad you asked! Add the ingredients to the pureed potatoes and transfer to casserole dish. Cover and refrigerate until tomorrow. Pull out of fridge and bake for 40 minutes (still covered). Take out of oven, uncover, add topping and bake again. If you make the casserole the night before, don’t bake until the next day. Hope that makes sense! In a word, YUM! Just made this tonight, and I substituted slivered almonds for the pecans (didn’t have any), and we all marveled at it’s deliciousness! Brilliant recipe. Thank you! Good to know, Andy! I hadn’t tried slivered almonds and I wondered if they’d be too crunchy. Thank you!! My family is staging a revolt and won’t allow the non-marshmallow sweets. I loved the flavor of your casserole and I am going halvsies on it for the kids. Who am I kidding…for everyone but me. For the batch that I bastardize, do I skip the final 40 minute baking step and just throw under the broiler to brown the marshmallows? Or does it still need more cooking time? Thanks! Too funny! I think you top with marshmallows instead of crunchy topping and bake until marshmallows are golden, probably about 25 min. If you’re in a rush, I guess you can broil for a minute. I have cheated and done 30 minutes covered, 30 minutes uncovered with topping and served immediately — seemed to be fine! I know. 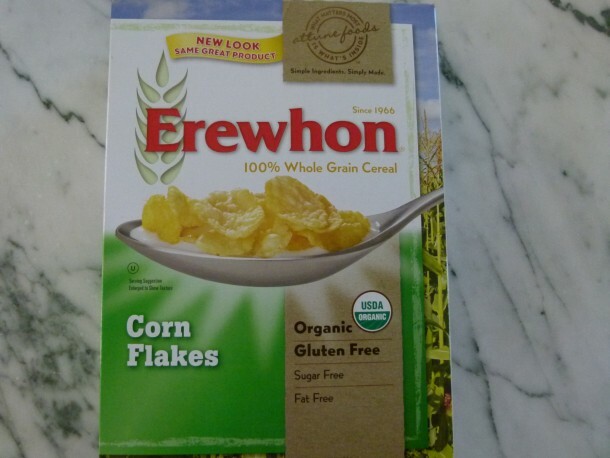 There is no unsweetened hemp milk in all of Los Angeles at the moment! Don’t fret. You only need 1 cup, so I would sub half coconut milk and half unsweetened almond milk. I think all coconut milk would be too rich. I haven’t tested it this way, but I am confident it will turn out great! One more glitch… Does it matter if I use Refined Coconut Oil instead of Unrefined? I missed that part at the grocery store… Is it just a texture thing? I was wondering if you use the same measurements for Coconut oil as you do for Butter in this recipe? I wonder if it could be veganized at all? I might try it, maybe with some tofu like the vegan tofu pumpkin pie recipes I’ve seen. The dairy is easy to replace, so it’s just the eggs. I think you could try dropping the eggs completing without substituting anything and it might be a little softer than this version, but still good. Or you could try adding a little silken tofu to the food processor with the sweet potatoes. I LOVE LOVE LOVE this recipe! It’s super delish. I will make one pan of this as you indicate and then I will do the white trash version with the mini marshmallows on it to satisfy that family tradition. I just have to say that this is truly one of the most delicious things I’ve ever eaten. Cannot wait to make it and impress the troops. Thanks Pamela! You’re going to do a great job, Teddi! Happy Thanksgiving! I had a few people over last Thursday night for a pre-Thanksgiving dinner and made your entire Thanksgiving menu from this month’s class. This recipe was the biggest hit! My husband said he would love to have this again and again. I did make it the day before and I did bake it before the turkey went into the oven. 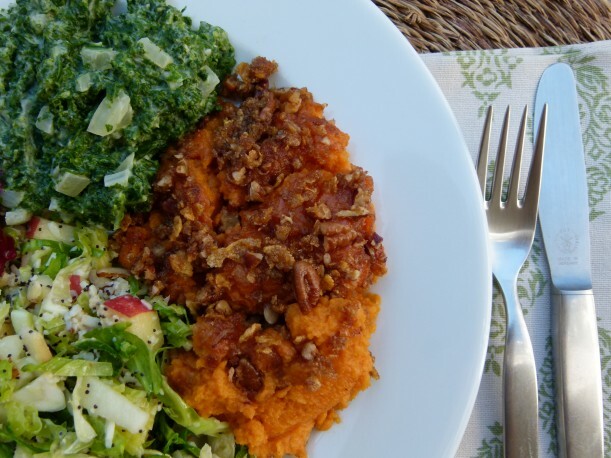 This is a perfect dish for a large holiday dinner. Thank you again, Pamela, for another winner.